As goes Motor City, so should go the world – or at least eco-activists might like to argue that. The archetypal home of American car culture, Detroit, has been decaying for years. It’s now collapsed from a city of two million to less than half of that, and in the process it has opened up dramatic possibilities for regeneration. These, like Timothy Fadek’s industrial ruins and Sean Hemmerle‘s Time magazine photo essay, include many that seem as if they’re right out of Andrei Tarkovsky’s Stalker. Bruce Gilden’s photo-essay on Detroit Foreclosures includes a poignant soundtrack reminding us what the current economic crunch feels like to some. The Time article that accompanies Hemmerle’s and Marchand/Meffre’s photos reports that among the ideas proposed for redevelopment of Detroit are “the reforestation of the city’s dead zones” and “the planting of large-scale networks of parks and commercial farms.” While there’s plenty of room for visionary public policy, Detroit doesn’t exactly have a long history of that kind of thing, so, if it was up to me, I would leave a lot of room for the anarchists and artists to get things going. Unfortunately, since Fifth Estate, the longest-running anglophone anarchist periodical in North America, moved out of Detroit in 2001, the local political scene seems a little less prepared for this kind of thing. Artists, however, have been busy making the urban landscape theirs. The price for grassroots eco-regeneration is certainly right: Jennifer Lance at environmental blog Red Green & Blue reports that you can buy a foreclosed home in Detroit for $40 these days. She even volunteers to do that and to donate it to any organization that would turn it into a park, wildlife sanctuary, or urban garden. Any takers? Describing the city as a “Wild Kingdom,” Detroitblog.org describes whole neighborhood blocks reverting to prairie, alleys resembling hiking trails, roving packs of wild dogs, feral cats taking over entire buildings, and a resurgence of pheasants, foxes, opossums, turkeys, roosters, and raccoons, along with imported “ghetto palms” (Ailanthus altissima) spreading through the city like weeds and, by their height — sometimes reaching several stories — offering a gauge for how long particular parcels have been neglected. 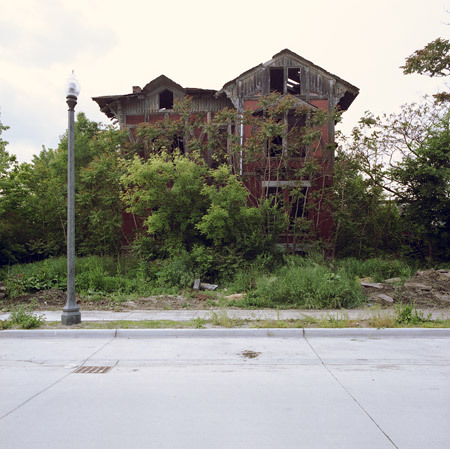 More photos of Detroit reverting back to nature can be seen here and here. The Greening of Detroit is an institutional non-profit working on urban eco-regeneration, while Motor City Blog keeps tabs on interesting goings-on. Hello my friend–thank you for your recent email. I’ve been away from my computer–and now I can’t get my email for some reason, in the godforsaken Dulles(t) airport where I’ve been waiting for a nonexistent plane all day. But I can’t wait to hear La Monte Young on lastfm–well done sir. And this post about Detroit is uncanny–I had a discussion with someone doing a Ph.D. on this very topic just yesterday. Derrick May is the great, great, lyricist of all this, no? Mmm, yes, there’s something about the history of Detroit’s music scene – from Motown to George Clinton to May, Atkins, Saunderson, et al – that conveys the city’s creative disintegration… (I think I first encountered that term in a book by Theodore Roszak, where he proposed that we need to creatively disintegrate industrial society). I’m not sure what’s happening in Detroit now – perhaps some post-industrial neo-tribal folktronica arising out of the ashes? Thats crazy. Sad Times for Detroit. Cleveland has much of the same problems. I guess it shows the evolution of the world, as much as we may not like it, over time, things do change. That photo doesn’t even look real! Poor Detroit. It’s a same what’s befallen the city. Even with the Riverfront revitalization project and the rest of the planned projects, there seems to be no end to the blight. I remember the UA theatre above in better days. Truly a shame it hasn’t been restored. Growing up just outside of Detroit these pics hit home. Something needs to be done to save the city, but crime, corrupt leaders, and apathy seem to be the norm. Interesting take on this subject. I will bookmark this site for future reference. Despite the ruins the inside of the cathedral looks very Gothic and dark. It has the feel of an old horror movie. While I am sure it’s not a pretty landscape on the outside I am sure if these could be restored they’d look simply amazing. 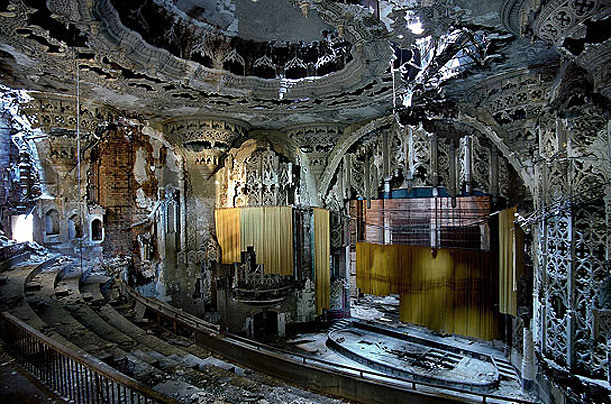 I’d almost say it’s a biblical end for Detroit to come down eaten by nature, but I’d rather see it as a re-birth or simply going back to basics. (By the way, poets and anarchists need an economic and a political power, respectively ,to flourish; If they find enough of any – not sure it’s the case here -, one thing they won’t need is a permit). We have had this kind of problem in inner city Ogden, Utah. We have a wonderful mayor who is determined to change things. And he’s getting it done! The right people with the right vision and determination can change things. Hopefully things get back on track soon. Detroit is an important city and its glorious recent past will come back. This is a tragic thing to occur to Detroit. With the current economy it could be a very long time before the situation improves. Certainly it will require a lot of new industry to provide sufficient employment to bring a repopulation to the area. Have the city and state leaders been working to bring business back? I like your post, Detroit is an important city and its glorious recent past will come back. It’s sad, very obvious in Detroit since it’s in the media, but there many other places in the country and in other countries, where the same thing is happening. I’m sure we will recover from this though. I have seen steady growth in sales for the past months in my area, and it’s looking promising.